Pre-S: Some of the links in this article are affiliate links! If you have a side hustle, you need to know how to track and manage your side hustle income – because it’ll save you time, money, and so many headaches at tax time. You guys know I’m a huge fan of tracking your personal spending, because it’s legitimately the best way to get a hard look at where your money is actually going, and it’ll be insanely great at helping you manage your money. 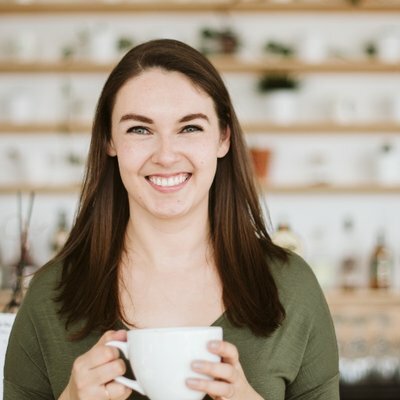 It’s no surprise that I’m also a pretty big stickler for tracking (and managing) your side hustle cash, but what is surprising is how much more I rely on automation to do it. Because fun fact: if you run a profitable side hustle on top of a day job, time is kind of at a premium. 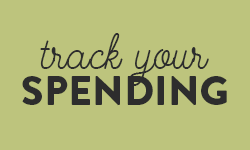 So while I highly recommend manually tracking your spending if you’re just getting started with personal-finance-101, I wanted to show you guys exactly how I manage and track my side hustle income – and the tools that save me, no joke, hours every single week. Hours I can spend working! If you have a full time job and a side hustle, your time is at a premium (and if you’re doing it right, you’re charging that premium for your side hustle skills.) So if you can save even an hour a week avoiding administrative tasks and let the internet and its magical software stuff handle them for you? That’s a good (and lucrative) deal. I use software to handle what I used to manage with a hacked-together combination of spreadsheets and PDFs: invoicing and expense tracking. Specifically, I use Freshbooks to invoice clients, track my expenses, and track and bill for hours. The fact that putting together an invoice now takes me 3 minutes, tops, saves me about 27 minutes per invoice – and beyond that, you can connect it directly to your business account or credit card to import all of your expenses. If you’re side hustling, and you’re going it as a sole proprietor (as opposed to incorporating) this is literally as easy as getting one extra credit card you only use for business expenses. At least, that’s what I did, anyways. … and this is where all my expenses on that card get auto-imported. Now all I have to do is log in and make sure the expenses are being categorized properly (spoiler alert, a lot of the times they aren’t) and I’ve got accurate records of what I spent on my business so far this year. And if I do have to correct an expense, I only have to do it once – I can teach Freshbooks how to categorize an expense by telling it to remember my category for next time. New side hustle idea: Photoshop drawing skillz for hire. Tracking your earning and spending is important for personal stuff, but it’s critical for side hustle stuff – aka, your business revenue and expenses. If you have meticulous records of the money you earned and spent in your business, you’ll save yourself or your accountant so much grief at tax time. On the expenses side of things, you’ll also save yourself a ton of money: You can reduce your tax bill by claiming any eligible expenses against your side hustle income. Whether you DIY using a tool like Simpletax like I did this year, or work with a pro-fresh-inal accountant, having clear records of what you spent, and when, on which categories in your business, is going to make someone’s job way faster. If it’s your accountant’s? Guess who just became their favourite client. Everyone loves being the favourite, you guys. Yes, I was that girl in school, I hope we can still be friends. I’ve written about this before, but investing in yourself – and in your side hustle – is one of the highest value things you can spend money on if you do it in a smart way. Think about “regular” investing – to really do it well, you need to understand how a business makes money, and how it’s performing, right? Well, there’s no business you’ll ever know more about than yours – so if you do your research and know that a specific type of spending will help boost your business, you’re probably right. The way I’ve handled it this year is that I set aside a specific percentage of my earnings from my side hustles to cover my expenses, and invest back into the blog. For every invoice that gets paid, I put 20% of it into a separate savings account for expenses. Speaking of things I do every time an invoice gets paid, I also set aside a percentage of that money to pay my taxes, because I’m a big fan of a) the things our taxes buy us, like free healthcare, and b) I’m a big fan of being able to handle a tax bill if one comes my way. For now, I’m putting aside my marginal tax rate on any new invoices that get paid – and keeping an eye out to make sure that tax rate doesn’t jump into the next marginal tax rate bracket. 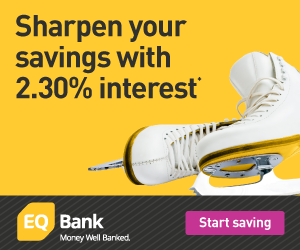 If it does, I’ll either adjust… or put all my money into an RRSP beyond that point. After taking care of my taxes and investing back into my biz, the rest of the money that comes in is up for grabs in my budget. 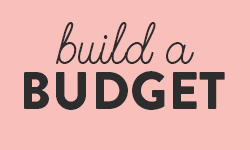 I’ve got a list of priorities in place for any “extra money” that comes into my budget (ahem, step #11 on the Quick Budget Fix checklist, and a lesson we just worked through in the course last week!) so I usually know exactly where I’m directing that extra cash. But sometimes, things come up or fun opportunities present themselves, and when they do, I’m not opposed to redirecting my treat yo’self side hustle cash to something even more fun than saving for closing costs. I’ve got my eye on this desk from Ikea for my office in the new house, to be honest. All this said, how you track and manage your side hustle income doesn’t have to be perfect, as long as it works for you. My system is decidedly not optimized as far as it could be. I chose my credit card because it was one I already had. Literally, when I called to cancel an annual-fee credit card, they were able to waive the fee if I signed up for their basic card. When I finally got around to dedicating one card to business expenses, I chose that one because it was already there – not because I did an extensive comparison of which one would earn me a marginal amount more points or cashback. Should I compare my credit card and choose one with better rewards? Totally, and I’ve got a post about how to do that all lined up for you guys. But do I need to do it in order to make my side hustle systems work? Nope. I could probably find a cheaper option for invoicing and record keeping. There are free alternatives to Freshbooks that are very good, with great interfaces, and come highly recommended. But when I sat down to really look at them, they took a bit more accounting skillz than I have – or, to be honest, want to have. Freshbooks is a happy medium for me and the size of my side hustle right now, where I don’t need a professional bookkeeper (more expensive) and I don’t need to sit down and figure out how to do accounting for real (more time). If my business grows? Sure, I’ll switch. For managing a side hustle? It’s pretty perfect for me right now. Can you give me the TL;DR version? If you need to manage your side hustle income, here’s what to do. That’s it! That wasn’t so hard now, was it? Love the idea of a separate credit card for business expenses, even if you’re not incorporated. I’ve had some side hustle income for a few years now and that never occurred to me. My personal and business expenses were always messed up on the same card. Great tips Desirae. Thanks! This might be helpful for you and any other Canadians: I (finally) got a credit card last year specifically for my business expenses and, at the time, anyway, the Rogers MasterCard was the only one available in Canada that didn’t charge a fee for currency conversion, FYI. That was a big deal for me since almost all of my expenses are billed in USD and it was costing me… well, not nothing. Now it’s nothing. They waive the annual fee if you use the card to pay any Rogers bills, so if you’re with them and you can write off your cell phone, internet, etc. then it’s a pretty good option, IMO. Ohhhhh I’ve heard about this card! The exchange thing kills me too, and it seems like a good card overall – I’m just not with Rogers (right now, anyways!) Plus I think someone would leave me if I suggested using non-TekSavvy internet, lol. Is that how you spell it? Whatever, you know the one. Still am going to look into it though! Thank you! I love Freshbooks! I couldn’t live without it. Luckily I don’t have too many expenses for my side hustle, but if I did, I can definitely see how the automatic would help. In my own life I actually enter in expenses manually. I prefer to do it that way because it lets me keep a tight handle on where our money’s going. I tried automating it before but things kept getting entered in wrong and it kept screwing up all my budget category balances. Plus my spending in some categories kept getting out of control when I wasn’t checking it daily too. If I keep taking on freelance work, this is something I will need to get a handle on! I am really bad about sending out invoices in a timely fashion. 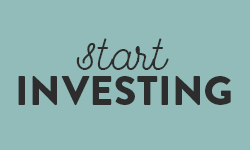 =( And I totally agree about investing in your own business! Great post! I also feel like a goober that it’s never even occurred to me to just pick one of my credit cards to put all my blog expenses on – like a business card. I churn so many cards and usually don’t cancel the no fee ones that that’s a snap. Hahaha don’t feel like a goober! It still took me forever and a day. 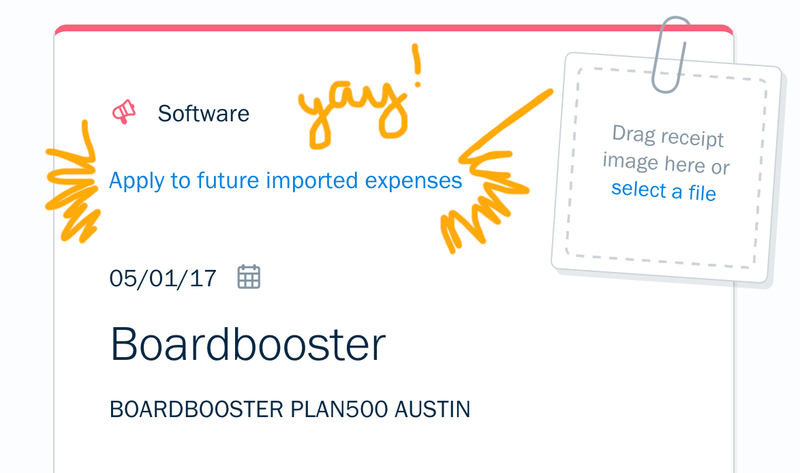 Like… let’s be real, I had this card sitting on my desk for about five months before I had the omg-what-if moment where it all clicked that this is how I could automate my expenses! It was very eureka and very delayed, lol.